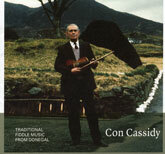 From Teileann in south west Donegal, Con Cassidy (1909-1994) was one of the great Donegal fiddle players of the past century. He was an influential player and the source of many a tune played and recorded by players of the younger generations, such as the members of the group Altan. This 36-track CD, produced by the same team who compiled the "Fiddle Music of Donegal" series, and bringing together recordings made at various times during the 1980s, clearly shows that this man could play. This is essential listening for fans and students of Donegal music. And unlike some field recordings where the players seem to have felt like they needed to record their "best tunes," and left out highlands, marches, and such, there are plenty of those kinds of tunes here, including the very curious arrangement of the French anthem "La Marseillaise." Biography and tune notes by Dermot McLaughlin, who also plays fiddle on three duets with Cassidy. 14 [spoken] Con tells the story behind "Taibhse Chonaill"